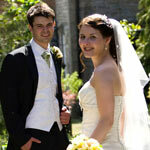 Wedding Flowers designs and Special Events flowers so perfect so that your happy memories last for ever. At Rose and Grace, we strongly believe that combining your ideas with our passion, flair for colour and style will make your wedding flowers designs truly memorable! "Thanks again for the wonderful work you did for us, all the flowers were beautiful and really added to our absolutely perfect day. My mum was also delighted with the magic you worked on the cake flowers, so thank you from her too! Yes we all had an amazing day and everyone commented on how relaxed the day felt with everything flowing together beautifully. The flowers were stunning from mine and my bridesmaids bouquets to the buttonholes. I was most thrilled with the table decorations - I had to sneak away to go have a look at the Great Hall without anyone in it and I must say that you created my vision perfectly. 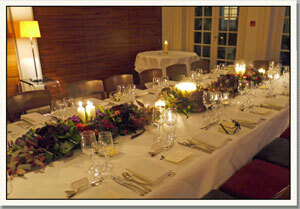 Not only with the flowers themselves but the way you organised the tables- it was fantastic! The hotel also did a great job of moving the church flowers and the table flowers to each room we were in next which meant I got to enjoy them all day! See more of Faith and Jon's lovely September Wedding Flowers here. We just wanted to write and say thank you so much for doing such a wonderful job with our wedding flowers. Everything, the bouquets, buttonholes, corsages, baskets and pedestal was absolutely beautiful, we couldn't have asked for more. So many of our guests commented on how stunning all of the flowers were - they were perfect! "For us flowers were one of the most important elements of our wedding day and you really took the time to understand what we wanted. In addition to really grasping the brief you were able to make further suggestions about what could be done enhancing our original ideas. Our expectations were exceeded. We had stunning flowers on the big day that were in perfect condition, the smell of certain flowers still evokes memories of our wonderful day. Just a quick note to thank you ever so much for the stunning flowers. They really made the wedding, and were all the more impressive given that we hadn't met and designed and discussed over the phone and email. I was so grateful to you for your suggestions and expertise. "You encapsulated my vision and expanded on it beyond belief, with flowers, tones and fragrance delighting all our guests'..... our sincere thanks for your endless ideas, impeccable delivery and attention to detail. 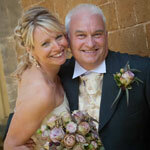 See more of Cath and James' Autumn WeddingFlowers here. 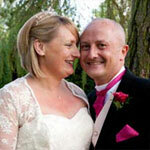 'Thank you so much for the fantastic flower displays and bouquets you made for our Civil Ceremony! It really put us at ease straight away when you said blue roses wouldn't be a problem as we were concerned when we chose to have them it may pose a problem for the florist - but not for you!! We had lots of positive comments from our guests - and at the end of the weekend many guests took table decorations home with them - even The Springs (hotel) asked to keep the bigger displays! 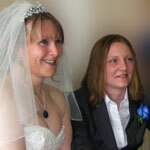 See more of Cat and Tina's Civil ceremony Flowers here. I would just like to say how impressed I was with the flower arrangements that you created for my grandmothers 80th Birthday celebration. You took my brief and created exactly what I had hoped for. Everybody commented on how stunning all of the arrangements were. I look forward to working with you again in the future! They were absolutely beautiful and complimented the day perfectly, thanks for all your efforts and and also for all the trouble you took to make sure I was kept up to date with all the developments. All the table displays went to various family members who were really pleased to be able to take home a token of the day! 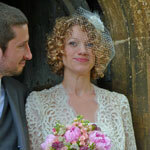 See more of Elizabeth and Alex's lovely May wedding flowers here. 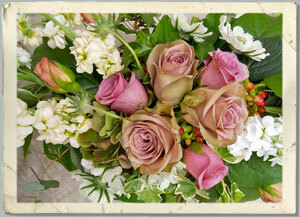 "...thank you for all your hard work and the beautiful flowers which you provided for our wedding day. Everyone commented on the arrangements and how stunning they were. I didn't just like the flowers, I loved them! "Thank you so much! It is lovely to know about the shamrock chrysanthemums, it is little touches like that which set Rose and Grace aside from the rest." See more of Caitriona and Max's beautiful August Wedding Flowers designs click here. 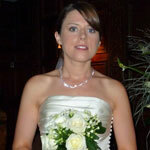 "We just wanted to day thank you so much for the beautiful flowers designs that you did for our Wedding last week. They were absolutely fantastic and far better than my expectations, we really cannot thank you enough. 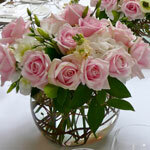 See more of the wedding flowers designs from Heidi and Gary's lovely day. 'Thank you for a super job with the flowers. They were exactly what I'd hoped for and you really got onto my wavelength. What a talent! 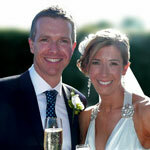 See more of Prue and Alex's lovely Wedding Flower designs here. 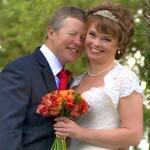 To see more of the special event flowers that we did for Lynn, Follow this link. You are now my one and only favourite florist! 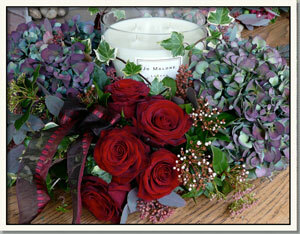 centre piece with Joe Malone candle for The Cotswold House Hotel. and we will get back in touch as soon as possible. If you would like to find out about our special Photography and Flowers packages, please visit our Photography website Photography website gallery where you can see lots of beautiful wedding photographs taken by Tony Young for Rose and Grace Photography.